Jazmeen is the Communications and Events Coordinator at YWCA Canberra. The 2019 She Leads College Conference was a one-day leadership event for young women, including female identifying and non-binary people, in years 11 and 12. The event, held Wednesday 20 March at the University of Canberra’s Ann Harding Conference Centre, engaged more than 100 young women to explore and hone their leadership identity and values, as well as reflect on their experiences, strengths, values, and goals. Students attended from eight different colleges across Canberra alongside four rural high schools from outside of the region. The 2019 conference theme was ‘Innovators, You(th) Can Change the World’, which paid homage to the global political and social action demonstrated by Gen Z within the past year. From Greta Thunberg to Emma González to Australia’s own, Amelia Telford, Gen Z continue to make media headlines as a result of their determination to actively voice their opinions on global social and community-specific issues. Not only have they made their voices heard, but they have also acted by organising rallies and demanding more from their governments. YWCA Canberra threaded this concept through the 2019 College Conference program, in support and celebration of young people’s desire to influence change. This was reflected by presenting young women, including female identifying and non-binary students with the opportunity to build on their practical skills and confidence so they can actively take on leadership roles within their schools, communities and future careers. The hilarious Maddy Weeks, local Canberra comedian and our MC, officially opened the event with the enthusiastic energy that she exudes in her very own stand-up shows. She opened by telling us that when she first started comedy in 2014, there were only three prominent female-identifying comedians in Canberra. To Maddy, this was extremely intimidating and somewhat discouraging. Despite this, Maddy continued to run with her passion for comedy and gained an experienced female-identifying comedian as her mentor along the way. She expressed the importance of finding a mentor within your field and how her mentor was able to impart both knowledge and friendship. Maddy explained that while gender equality within the Canberra comedy scene is getting better and that in 2019, there are now around 20 prominent female-identifying comedians, there is still a long way to go. 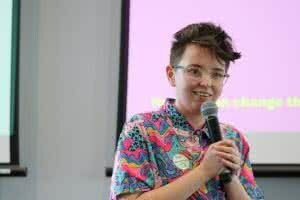 Maddy’s personal experience within the Canberra comedy scene inspired her to go on to form part of comedy troupe ‘ACT Like A Lady’, a group of female-identifying comedians, who aim to seek out and foster the comedic talent of female-identifying and non-binary people in the ACT. 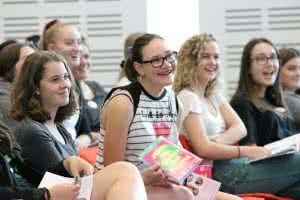 ACT Like A Lady encourages girls, women and female-identifying people to take up space within the scene. Taking up space is something Maddy believes we should apply to all areas of our leadership journeys, “don’t be afraid to take up space, you are worthy of being listened to. Never apologise for existing!” she reiterated. 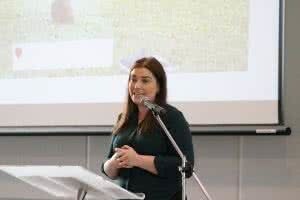 Next up, was our powerhouse keynote speaker, Emma Byrne. At age 28, Emma is one of the youngest senior managers in the ACT Government and the recipient of the ACT/NSW Young Achievers Award for Leadership. 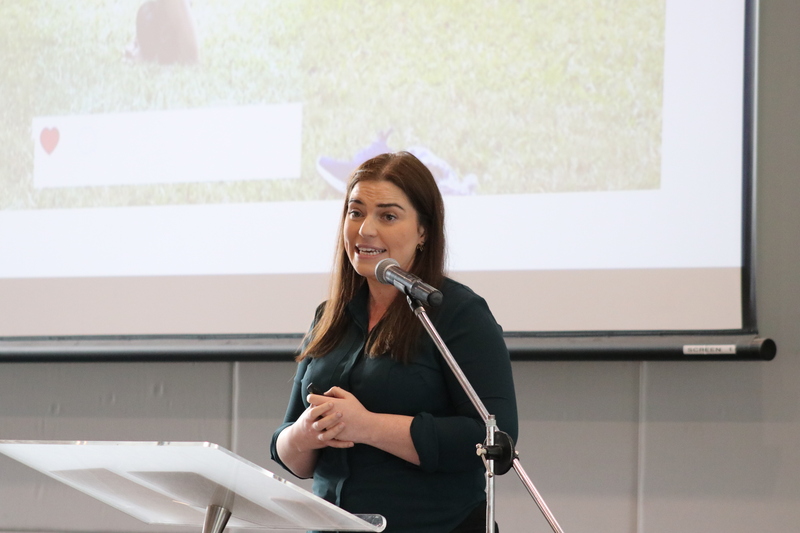 Emma explained how she believed her leadership journey began when she was named 2009 Young Citizen of the Year for Wagga Wagga and spent 10 days trekking the Kokoda Trail. “You don’t need to know what you want to do when you grow up, because it’s certain to change a couple of times. Say yes and discover what you are passionate about.” She went on to talk about how success is best achieved through working hard, getting good at what you are passionate about and mastering it. Emma went on to say that after you work out what you are passionate about, it is essential to “grow grit”, a fundamental concept that she attributes to her success. Emma explained that growing grit allows you to become more resilient as things aren’t always going to go according to plan. 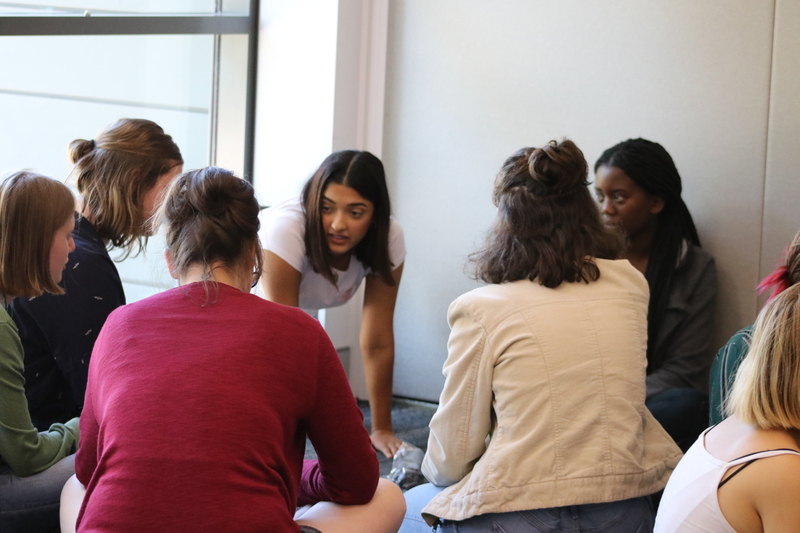 The day included two separate workshops, the first workshop ‘You Can Be An Innovator’, facilitated by YWCA Canberra Youth Engagement team, explored exploring social issues and what systems and attitudes in place can be changed for the better. They taught us skills surrounding communication, relationship building, self-care and managing criticism. The second workshop, ‘What YOU have to offer’, facilitated by Defence Force Recruiting, pushed us outside of our comfort zone and helped us to find the confidence to embrace our inner leader, negotiator and critical thinker through a range of activities. 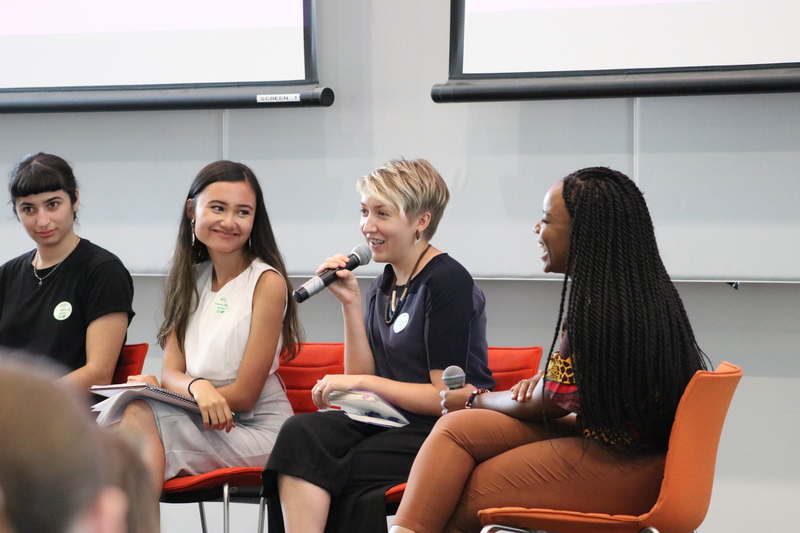 After a short morning tea, it was time for our panel discussion, ‘Innovators’, facilitated by Kemiso Matlho, and panellists included Tina Dixson, Yasmin Poole, Georgia Maq, and Renee Songoro. As Kemiso asked the panellists questions, it became apparent that they were all strong leaders in their respective fields, despite having varying passions, careers and aspirations. Kemiso told us how we are never too young to enact change, whether it be on a small or a large scale. Kemiso asked the panellists if they saw themselves as innovators, Georgia responded with “to me being an innovator means seeing the problem in your heart and changing it. My band saw problems in the music industry and set out to change it within our own shows.” Georgia explained that when she first got into music, at 18, it was discouraging being a solo female artist opening to all-male bands, something that is still a constant occurrence in the music industry today. She explained that this is the reason why she chooses to use her public platform to draw attention to the issue, alongside many others. Renee answered the question by stating that First Nations people are some of the greatest innovators of the world and explained why it is, therefore, necessary to ensure First Nations people are included at the table and have their voices heard. Reflection is an important part of any leadership journey and She Leads College Conference is no different. At the end of the day, Maddy asked everyone to write what they would like to achieve by the time they turned 25 on a sticky-note and attach it to the ‘Goals’ wall. We have put these into a full list that you can read here. As Maddy started her closing remarks, she reiterated that we must take up space, we must ensure that our opinions are heard, as we all have the capacity to be innovators. Want more? Visit our Flickr album to view all of the wonderful photos from the day or check out this blog post to read all of the student’s goals from the day. Follow our Facebook and Twitter pages, and subscribe to the monthly She Leads Newsletter to receive updates on future events. You can also join as a member to receive discounts on future events and other opportunities. Stay tuned for our She Leads High Conference which will be held on 1 November 2019.